Varied hues in sunset span streaks of blue and white, while skies in early daylight emerge dimmer day by day. A sense of quiet fills the air as if our ruffled, feathered, friends rest just a bit later. Enthusiasms subdued since early spring, as each morn boldly proclaimed the wake of day in loud, sharp rapid fire chatter, sing-song, chirping. Perhaps for some, their extended vacation visit has ended, have these begun their journey south? Rays of sunlight push through still, though the glare of light moves round the house much slower. Hot air still breathes its beating temperatures by day, often making its closure finely adorned in blazing pinks and oranges. Little reminders of nature’s fleeting moments. Shortly days shall flirt as a fickle girl contrasting between slightly dipped temperatures to beating hot extremes. Some will say they cannot wait for it to end, and a new season to begin, others will cling tightly to those remaining days of suns unrelenting heat. Strawberries so quickly picked and gone, cherries, then blueberries, now yield timely selections of blackberries, soft ripened peaches, stalks of sweet corn, juicy red tomatoes, yet another brief window of bounty until just before frost, finally then remains crisp apples for the picking. There shall be time for the preparation of long simmered indoor recipes shortly ahead, now though, only time for gathering in the final seasons warmth, suns powerful heat, light giving days, exposing simple reminders in the truth that every time has a purpose, and every season. Sometimes not everything needs a recipe, just simple enjoyment of the moment, final days of early morning sunlight, varied hues in sunset streaking blues and whites across the skies, days of outdoor cooking, purposeful savoring ease, Grilled Pineapple and Shrimp Skewers. Combine shrimp, garlic, hot pepper flakes, lime juice, olive oil, cilantro, salt and pepper, stir well to combine. Cover with plastic wrap and marinated for an hour. Preheat grill. Place pineapple onto a well oiled grill tray, grill for three minutes, turn over chunks. Place another well oiled grill tray next to the pineapple and topple on the shrimp. Grill shrimp around four to five minutes or just a bit longer depending on grill heat until pink and just cooked. 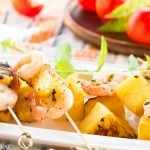 Remove grilled pineapple and shrimp trays from the grill, skewer shrimp and pineapple alternately, serve on a tray garnished with some fresh herbs. This entry was posted in Fish, TAILGATE / Team Family and tagged Grilled Pineapple, Grilled Pineapple and Shrimp Skewers, Shrimp Skewers. Bookmark the permalink. Post a comment or leave a trackback: Trackback URL. 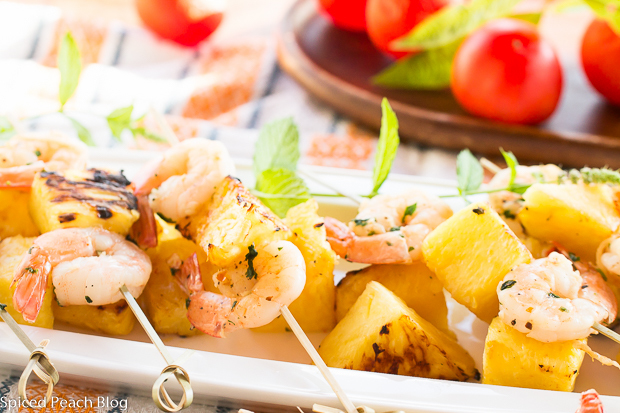 Peggy, a lovely combination of fresh flavor – the perfect food for late summer dining – we love shrimp and we love pineapples and we love skewered food – this is just a perfect recipe for us! Hope all your August cooking is going well! Hi Andrea, thanks so much. Looking to some no fuss recipes about now, and especially with so much effort currently going into my garden crop in between summer activities! Will the fall and winter be calmer? LOL! 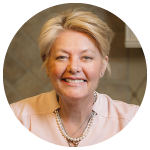 Enjoy grilling- and especially now that you are a ‘grilling champ!’ See you soon Kitchen Lioness. I love shrimp! I made this over the weekend and it turned out great. My wife isn’t a shrimp fan so I made a couple skewers of scallops. Everyone was happy! Hi Doug, so happy your grilled combo turned out nicely. Few things are so easy that also really bring on the flavor and color at the same time. The scallops sound nice too, good that everyone was happy in the mix! I love shrimp too, just prepared some last night in mustard sauce as part of our Diner En Blanc picnic in Philadelphia! Thanks so much for stopping by. My family went absolutely bonkers when my husband told them he was grilling pineapple on July 4th. Not the most common thing where I grew up, and everyone loved it! Hi Farin, that’s so fun, and great that everyone loved it! I know what you mean too thinking grilled pineapple is a more recent notion (well perhaps not in Hawaii or the South Pacific) but in general among the main stream. The depth of flavor is terrific, and so sweet. Looks like we are all quick studies on appreciating this delicious preparation! Thanks for stopping by!